The tackle is right, the bait is right, the swim is right and all that's left is to catch a fish and to play it correctly and finally....land it safely! 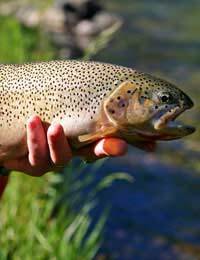 Float fishing allows bait to cover an extensive area particularly in rivers and streams. Having a float also means that the depth of the bait in the water can be adjusted. But the main function of a float is to indicate when there is a bite on the hook that, in turn, will signify the moment to strike. The most obvious indication that a fish has taken the bait is when the float is dragged sharply beneath the surface. However, when fishing for perch with lobworm it pays not to strike immediately because often the fish has merely tugged at the end of the worm. Sometimes, rather than being pulled down, the float lifts and then falls flat on the surface. This could be a sign of shallow water but in some situations particularly when fishing ponds and lakes, a lifting float means a fish has taken the bait off the bottom. Persistent bobbing of the float usually tells the angler that fry are nibbling at the bait. However, occasionally these tentative bites are caused by curious but nervous larger fish. Reeling the float in slightly will make the bait move and prompt the fish into taking the bait. When legering watch the end of the rod for twitches and jerks. These movements will be more defined if the rod is angled away from the bait rather than pointing straight at it. Holding the line between finger and thumb when legering is an exciting way of detecting bites because you can actually feel the fish attacking the bait. This method of feeling for bites is called touch legering. The fish has taken the bait and the strike has been made. The fish is on the end of the line but doesn't want to be there! Instinct has kicked in and the fish is fighting for survival. If the fish is not played carefully you will lose the catch and the fish will win its freedom. The power of some fish, such as pike, barbel and carp, has to be respected. Often fish cannot just be reeled in but instead have to be played. Line has to be allowed to be pulled from the reel by large fish otherwise the tackle will snap. Keep the rod held fairly high to absorb some of the strain. If the fish is battling in fast water hold the rod more to the side. This technique is called side strain and prevents the fish from reaching the surface and throwing the hook. Chub and barbel, when hooked, will head towards underwater snags. It is important not to allow large fish to have complete control. Steer them to clearer water and maintain a steady pressure on the line. Before catching a fish make sure you are in a place where the fish can be landed. Surrounded by dense vegetation or sitting on a high bank could cause problems for getting the fish out. Check the water close to the bank for underwater snags and patches of weed. A landing net is essential for bringing in the fish safely. Have the net close at hand and choose a net with a telescopic handle for extra reach. When the fish is ready it can be reeled in towards the bank. Submerge the edge of the net and draw the fish steadily towards it. Crouch if possible and keep movement to a minimum otherwise the fish could become alarmed and make a final dash for freedom. To avoid harming the fish hold it using a damp cloth or wet your hands first. Take care when handling perch because they have a spiky dorsal fin. Use barbless hooks because they are easier to remove from the fish. To cause the least stress to the fish return it to its natural environment as quickly as possible. I am losing big carp in the margins. I am on the pole, size 14 hook, 18 and 25 elastic, the fish are 10 pound ish. The margin has a snag hence the heavy elastic. Usually after its initial run i am pulling out violently, what am i doing wrong?